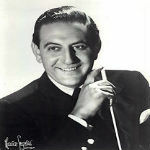 Guy Lombardo (June 19, 1902 – November 5, 1977) was a Canadian-American bandleader and violinist of Italian descent. Forming The Royal Canadians in 1924 with his brothers Carmen, Lebert, and Victor, and other musicians from his hometown, Lombardo led the group to international success, billing themselves as creating “the sweetest music this side of Heaven”. The Lombardos are believed to have sold between 300 million phonograph records during their lifetimes, many featuring the band’s long time lead singer, Kenny Gardner. Lombardo was born in London, Ontario, to Italian immigrants, Gaetano Sr. and Lena Lombardo. Lombardo and his brothers formed their first orchestra while still in grammar school and rehearsed in the back of their father’s tailor shop. Lombardo first performed in public with his brother Carmen at a church lawn party in London in 1914.